Violinist Tiani Butts made her solo debut in 2015 as the Bay Youth Symphony concerto competition winner. She has been playing the violin for twelve years and studies at the McDuffie Center for Strings with Amy Schwartz Moretti and David Kim. 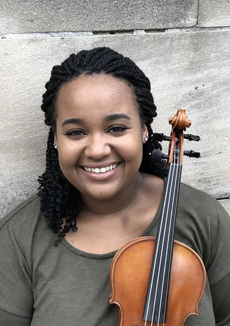 She has been concertmaster of the Bay Youth Orchestra of Virginia, the Governor’s School for the Arts Orchestra, and the McDuffie Center for Strings Ensemble, and she performed at Carnegie Hall in 2012 and 2017. During the summers she has attended the Aspen Music Festival, the Philadelphia International Music Festival, and the Wintergreen Summer Music Academy.